An innovative album from peace educator and singer/songwriter Paulette Meier. A fun and musical way for children to learn life long skills for building better relationships! Parents, teachers. counselors, youth ministers and recreational leaders recommend it as a wonderful tool that helps children deal with everyday issues and conflicts, and learn concepts and skills for creating caring communities. The 14 songs feature engaging lyrics, contemporary sounds, and energetic vocals from a diverse group of musicians, including children and teens. From country to reggae, blues to hip-hop, the variety of musical styles entice children of all backgrounds and ages--as well as the adults listening in! The latest edition includes a bonus feature of 7 instrumental sing along tracks! ​All 21 songs from the CD with guitar chords. Makes a great companion piece. 14 Reasons to Come Join the Circle … Click HERE to see why! 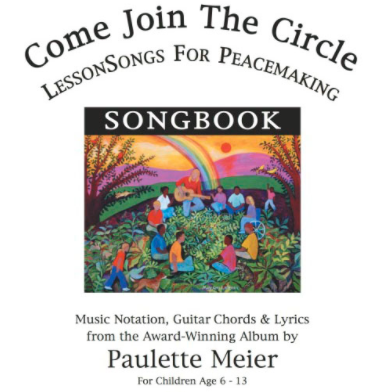 In this video montage, you will hear the title cut of Come Join the Circle: LessonSongs for Peacemaking, plus you will see studio footage of the wonderful 6th grade students who contributed their voices to the songs. This chorus of students was organized and led by their music teacher, Ms. Lois Shegog, who is the assistant director of the celebrated MUSE Women's Choir in Cincinnati. You will also see footage of Paulette, leading groups of children in song and in learning the tools of peacemaking. Please check out the "Performance and Booking" page for information about bringing Paulette to your school, library, church, or after-school program to work with your children! Click here for an interview with Paulette about the CD. Click here for classroom use ideas and commentary! "The songs -- melodic and catchy, but never preachy -- just might inspire your children to work things out." - Suelain Moy, Parenting Magazine. "Excellent content, beautifully recorded, well sung and played. I love the variety of styles." -Peggy Seeger, internationally known singer/songwriter and recording artist.